If you have an ecommerce site that sells lots of items as well as accessories for those items, using Average Order Value is a great KPI to define and monitor. The below chart shows why. As you can see, a small increase in your average order value can have far-reaching consequences on your bottom line! Start monitoring your average order value and work to find ways to upsell and cross-sell accessory items and complementary services. This is a great KPI to monitor because most visitors will not convert on their first visit. A visitor may come to your homepage, bookmark it, come back later and read some articles and then - finally - come back again to register for your newsletter or make a purchase. It may take several visits before enough trust is established to close the measured conversion. This is especially true if your products and services are expensive or somewhat complicated. The main purpose in monitoring this metric is twofold. 1. Different marketing channels may have different lag times to conversion. Understanding this allows you to allocate your budget towards those marketing vehicles that convert faster. After all, the more people you convert in a specified period of time, the quicker you'll achieve your overall objectives. 2. By monitoring this metric, you can work to test various changes to your site in an effort to decrease the overall "Visits to Conversion." The free Google Analytics tool has the ability to monitor Visits to Conversion. How engaging is your website? Is your assignment writing service site really interesting? Is it such a great resource that people want to come back time and time again? Or do most people visit just once, only to never return as long as they live? Visitor loyalty is a great business KPI to monitor as you work to strengthen your brand and make your site more engaging and compelling. But how does one actually measure website loyalty? Once again, it's Google Analytics to the rescue! By monitoring the change in visitor loyalty from month to month, you can actually see how an improvement in your branding and content is working to engage your customers. If you can't engage your site visitors, you'll have a difficult time convincing them to make a purchase or to fill out a registration form. By the way, Google Analytics also allows you to set up and monitor Visitor Recency(time since previous visit), Length of Visit (time spent at the site) and Depth of Visit(number of pages viewed per visit.) These are all fantastic KPI's to monitor on a monthly basis. All of the above KPI's have one thing in common. They refer to your own business universe. How about defining a KPI that allows you to monitor yourself against your competition? While there are many tools out there with sophisticated competitive intelligence reports, they can be a bit expensive for the small business owner. Fortunately, some of these tools provide some free reporting services. While you won't be able to drill down to specifics, you'll certainly get an idea of where you stand with respect to your competition. Compete.com offers a free tool that gives a rough indication of unique website visitors over time. What makes this tool so useful is that you can enter your website along with four additional competitive websites, and see how your site compares in overall traffic volume. Since my past marketing work involved the distribution of scientific instrumentation, I decided to compare three different instrumentation distributors against each other; Daigger, Cole-Parmer and Lab Safety. The below screenshot from Compete.com shows the trend in unique visitors between these three organizations. The real value in this report is not any particular monthly figure, but the trend over time. As you work to optimize your web pages, add additional helpful content for your customers, and drive higher numbers of quality inbound links, you'll be able to see the efforts of your work relative to the competition. There are many types of KPI's you can define and monitor for your business. Start with just a few and add more as you gain knowledge. 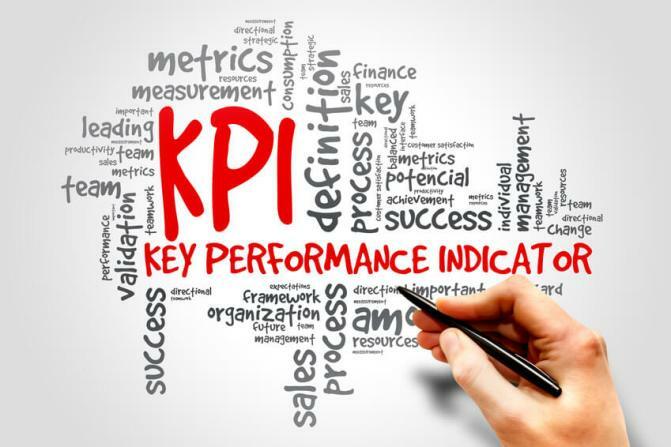 KPI's are an important tool in providing external validation of all your hard work. In addition, once they are set up, they are a quick way to determine the overall health of your business and will allow you to take corrective action before it's too late. Start defining your business KPI today and profit from the power of strategic marketing!